The lady herself often occupies an exalted role: she is a goddess, a saint, a queen, a princess, or something similar. Generally, she is very pure, sometimes to the point of seeming unapproachable. If she is unmarried, she is chaste. She is also often a Proper Lady. If it's not just the fact that she's inspirational, but that he feels like she's above him, she's a Peerless Love Interest. Compare to The Mentor, The Lost Lenore, Manic Pixie Dream Girl, and Men Act, Women Are. Called "Meeting With The Goddess" in Joseph Campbell's The Hero With A Thousand Faces. When the hero's muse is another hero, it's The Knights Who Say "Squee!". Kisara, the vessel of the White Dragon in Yu-Gi-Oh!. She provides an almost literal light to balance Priest Seto's inner darkness, and her Heroic Sacrifice and death in his arms provides the inspiration for his reign. Miu in Kenichi: The Mightiest Disciple. She's the granddaughter of the World's Strongest Man, and she's always been a better martial artist than Kenichi, who makes it his goal to be strong enough to protect her. Deconstructed by Osamu Tezuka in Barbara, released during the peak of his Gekiga period. The Hero's Muse is no idealized woman but an alcoholic, filthy, and rude prostitute (still a Shameless Fanservice Girl), yet she's explicitely refered to as a muse since she embodies everything that inspires an artist. Plus, she actually IS a Greek muse. She also counts as a parody of the Manic Pixie Dream Girl. In Saint Seiya, the Anti-Villain Cassios sees his master Shaina as his inspiring muse since she was the one who taught him how to fight. Even more meaningfully, he commits a Heroic Sacrifice to spare Shaina the pain of losing the man she loved, Seiya. As he's about to pass away in Seiya's arms, Cassios explicitely calls Shaina his "inspiring muse". In A Knight's Tale, Jocelyn is the noblewoman who has never been unhorsed. William: Your name, lady. I still need to hear it. Jocelyn: Sir Hunter, you persist. William: Perhaps angels have no names. Only beautiful faces. In the 1977 film Julia, the title character essentially fulfills the trope. The twist is that the main character being inspired to action is also female and both of them are presumably heterosexual. The powerful and mysterious Sisters of Orion in Alterien serve this purpose for Oberon. In Astral Dawn, the Mayan goddess of the moon, Ixchel, literally serves this purpose for Caspian. She's also his love interest. 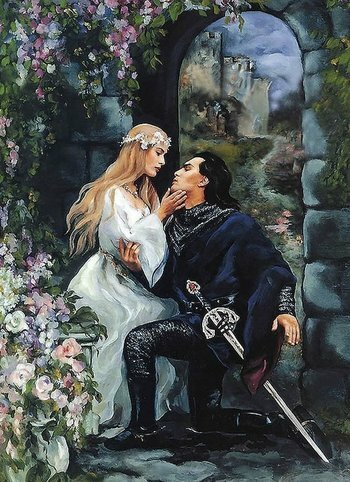 In the first book of The Faerie Queene, The Redcrosse Knight is guided and inspired by his love, Una, who is the personification of the "true church". In Stardust, the main purpose of Victoria is to motivate Tristan to go into the fairy world. It is then subverted by having her not be important thereafter. In Don Quixote, the eponymous hero fights for his lady love, to whom he refers as Dulcinea. In his mind, he elevates her to a princess and the most beautiful woman in the world, although she is in reality a peasant girl named Aldonza. Forever Gate: Ari, his daughter, is the inspiration for all of Hoodwink's actions. As this involves pulling him into her freedom fighter activities, she invokes this trope to ensure his assistance. Babylon 5 has Delenn for John Sheridan in the back half of the fourth season, when they are separated on their separate quests (hers to help rebuild the fractured society of the Minbari, Sheridan to overthrow the corrupt President Clark and restore a real democracy to the Earth Alliance). Unlike most other examples, they're already engaged to be married, but can't do so until the galaxy is no longer about to fall apart around their ears. Space: Above and Beyond: Nathan West joined the Marines in hopes of being deployed to the new colony that his girlfriend had gone off to (West was supposed to go as well, but got pulled at the last second). Soon after, a war breaks out with a newly discovered alien race, and the colony is captured. Everyone in the Wildcards are determined to win, but they note that only West's motivation is so personal. Doctor Who has touched on this a few times. Often the Doctor's driving motivation to help is the (usually female) companion he has with him at the time, either due to her encouragement or because she finds herself imperiled. Due to story-related reasons too complex to relate here, the 2005-2006 companion Rose Tyler and the 2012-2015 companion Clara Oswald at times satisfy the "idealized woman" aspect of the trope as well. Penelope in The Odyssey plays this role to Odysseus, making this archetype at least Older Than Feudalism, if not older than that. Warhammer: The Bretonnian knights, being Arthurian knights in France, follow the cult of the Lady, a mystical figure who gives visions and quests, leading to drinking from the Grail. Warhammer being the cheerful and happy place it is, the Lady may or may not be an elaborate hoax pulled off by the Wood Elves to protect their lands. Bioware games tend to have one good female character as a romantic option for the Player Character, and they tend to get upset with you if you do something For the Evulz. Obviously, these are Bioware games, so this trope can just as easily be Played Straight, averted, subverted (you Corrupt the Cutie), inverted (the player character could be the one who inspires), etc. Knights of the Old Republic has Bastila Shan. Dragon Age: Origins has Leliana. Mass Effect has Ashley Williams. Pit in Kid Icarus: Uprising is completely devoted to Palutena and stands beside her despite her constant trolling. Deconstructed in The ClueFinders Reading Adventures. Owen is Wrong Genre Savvy and looks to Princess Malveera this way for most of the game. Over the course of the game, Joni gradually realizes that there is something up with the Princess, but Owen refuses to see it until The Reveal. It turns out the Princess was just a disguise used by the Big Bad to take advantage of the Macguffin Delivery Service. Beatrice turns out to be this for Battler in Umineko: When They Cry, rather like the lady from The Divine Comedy for whom she was named. Any time a woman is on the British throne, expect her to be invoked as this - all the way from Boadicea to Queen Victoria (this was especially prevalent in Queen Vicky's time), and even the current Queen.